declaring war on ISIS in response to the attacks on Paris that left 129 dead and hundreds injured on Friday night. Anonymous wants to “launch the biggest operation ever” against the terrorist group, and ISIS is apparently taking notice – though the organization apparently believes Anonymous are “idiots” for even considering digital warfare. “Anonymous from all over the world will hunt you down. We will launch the biggest operation ever against you,” a masked person said in the hackers’ video. “Expect massive cyberattacks. War is declared. Get prepared.” In response, a Telegram channel that is believed to be affiliated with ISIS hackers sent out a warning message in Arabic and English, telling others how to thwart Anonymous hacks. “The #Anonymous hackers threatened in new video release that they will carry out a major hack operation on the Islamic state (idiots),” the statement said, according to Business Insider. “What they gonna hack?” ISIS asked, noting that so far, hackers have only managed to hit ISIS-affiliated Twitter accounts and email addresses. The message on the Telegram channel, an encrypted chat service that may have been used to help plot the Paris attacks, also says that followers should not open any links unless they’re sure of the source, change IP addresses “constantly,” and “not talk to people [you] don’t know on Telegram” or through Twitter direct messages. 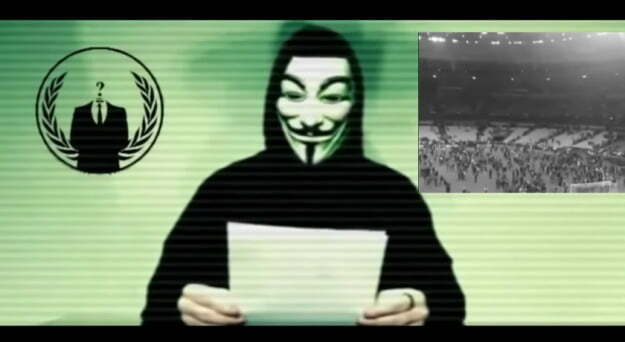 This isn’t the first time Anonymous has set its sights on ISIS. Following the January Charlie Hebdo attacks, hackers tried to identify ISIS social media accounts and take down extremist websites. The Anonymous video follows below. Last March, Anonymous had “delivered” at 9,200 Twitter accounts related to Islamic state group to alert on the growing presence of Daech on social networks.